Aerojet Rocketdyne is an American rocket and missile propulsion manufacturer. Headquartered in Sacramento, California, the company is owned by Aerojet Rocketdyne Holdings. Aerojet Rocketdyne was formed in 2013 when Aerojet (then owned by GenCorp) and Pratt & Whitney Rocketdyne were merged, following the latter's acquisition by GenCorp from Pratt & Whitney. On April 27, 2015, the name of the holding company, GenCorp, was changed from GenCorp, Inc. to Aerojet Rocketdyne Holdings, Inc.
RS-25 (LH2/LOX) – Also known as the Space Shuttle Main Engine, it was the reusable main engine for the now-retired Space Shuttle. 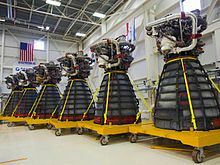 Remaining engines are scheduled for use on early Space Launch System launches after which an expendable version, RS-25E will be developed for follow-on SLS launches. RL10 (LH2/LOX) – Developed by Pratt & Whitney and currently used on both the upper stage of the Delta IV as well as the Centaur upper stage for the Atlas V. Formerly used on the Centaur upper stage for Titan, the Saturn I, and on the vertical-landing McDonnell Douglas DC-X "Delta Clipper". It was intended to serve as the main propulsion engine for the proposed Altair lunar lander. RS-68 (LH2/LOX) – First stage engine for the Delta IV, designed as a simplified version of the SSME due to its expendable usage. It is the largest hydrogen-fueled rocket engine ever flown. J-2X (LH2/LOX) – Engine was originally being developed for the Ares I's upper stage before the cancellation of the Constellation program. The engine was considered for the Space Launch System's Exploration Upper Stage before being replaced with a cluster of four RL10s. Baby Bantam (kerosene/LOX) – In June 2014, Aerojet Rocketdyne announced that they had "manufactured and successfully tested an engine which had been entirely 3D printed." The engine is a 22 kN (5,000 lbf) thrust engine. AJ-26 (RP-1/LOX) – Rebranded and modified NK-33 engines imported from Russia. Used as first stage engine for the Antares before being replaced by the RD-181. AJ-60A – solid rocket motors for Atlas V launch vehicle. Blue Origin CCE (SRM) — the Blue Origin New Shepard Crew Capsule Escape Solid Rocket Motor is built by Aerojet Rocketdyne. SJ61 (JP-7/ingested air) A dual-mode ramjet/scramjet engine flown on the Boeing X-51 hypersonic demonstration vehicle. AJ10 (A-50/N2O4) Second stage engine for the Delta II, used as OMS engine for the Space Shuttle, and the main engine for the European Orion Service Module. AR1, a proposed 500,000-pound-force-class (2,200 kN) thrust RP-1/LOX oxidizer-rich staged combustion cycle engine. The AR-22 is an engine in development in 2017 for the XS-1 spacecraft, based on the Space Shuttle Main Engine and utilizing parts remaining in Aerojet Rocketdyne and NASA inventories from earlier versions of the SSME. Two of the engines will be built for the spaceplane. On 13 October 2017, it was reported that Aerojet Rocketdyne completed a keystone demonstration on a new X3 ion thruster, which is a central part of the XR-100 system for the NextSTEP program. The X3 ion thruster was designed by the University of Michigan and is being developed in partnership with the University of Michigan, NASA, and the Air Force. The X3 is a Hall-effect thruster operating at over 100 kW of power. During the demonstration, it broke records for the maximum power output, thrust and operating current achieved by a Hall thruster to date. It operated at a range of power from 5 kW to 102 kW, with electrical current of up to 260 amperes. It generated 5.4 Newtons of thrust, "which is the highest level of thrust achieved by any plasma thruster to date." A novelty in its design is that it incorporates three plasma channels, each a few centimeters deep, nested around one another in concentric rings. The system is 227 kg (500 lb) and almost one meter in diameter. ^ "Two engine rivals merge into Aerojet Rocketdyne". Spaceflight Now. 18 June 2013. Retrieved 22 June 2013. ^ Roop, Lee (June 17, 2013). "Here's how Aerojet Rocketdyne might bring 5,000 new aerospace engineering jobs to Huntsville". www.al.com. Alabama Media Group. Retrieved 2016-10-03. ^ "History". Aerojet Rocketdyne Holdings, Inc. Archived from the original on 2016-08-07. Retrieved 2016-10-03. ^ "Aerojet Rocketdyne 3D Prints An Entire Engine in Just Three Parts". 3dprint.com. 2014-06-26. Retrieved 2014-08-08. ^ "Aerojet Rocketdyne Motor Plays Key Role in Successful Blue Origin In-Flight Crew Escape Test". SpaceRef.com. 6 October 2016. ^ "AR1 Booster Engine". Aerojet Rocketdyne. Retrieved April 14, 2017. ^ "Aerojet Rocketdyne Selected As Main Propulsion Provider for Boeing and DARPA Experimental Spaceplane". 24 May 2017. Retrieved 24 May 2017. ^ a b c d Pultarova, Tereza (13 October 2017). "Ion Thruster Prototype Breaks Records in Tests, Could Send Humans to Mars". Space. Retrieved 2017-10-13. ^ a b Mcalpine, Katherine (19 February 2016). "Hall thruster a serious contender to get humans to Mars". PhysOrg. Retrieved 2017-10-13. ^ PEPL Thrusters: X3 University of Michigan. 2017. ^ Wall, Mike (26 April 2016). "Next-Gen Propulsion System Gets $67 Million from NASA". Space. Retrieved 2017-10-13.